St Michael's Hospice after the fire in July 2015. Photo by Eddie Mitchell. St Michael’s Hospice has been handed a substantial fine for breaching fire safety law, as part of an investigation into the devastating fire in 2015. 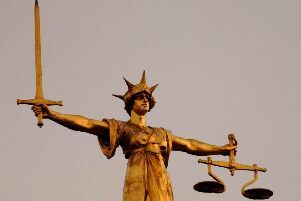 At a court hearing today (Wednesday, March 28), the charity received a £250,000 fine after pleading guilty earlier this month to two breaches in fire safety laws. The breaches were of Articles 8(1)(a) and 8(1)(b) of the Regulatory Reform (Fire Safety) Order 2005. These charges relate to the hospice’s overall failure to take general fire precautions to ensure the safety of its employees and non-employees. The hospice pleaded not guilty to 11 other breaches. In a joint statement released after the judge's decision, chair of St Michael’s Hospice Irene Dibben and chief executive Karen Clarke said:“We remain truly sorry for the pain and anguish caused by the fire. We also share the pain of our own staff and volunteers, many of whom are still coming to terms with the full devastation of the fire. A pre-inquest review - due to be held in May - is set to look into the deaths of three people who died in the days following the hospice fire in 2015. A man was later charged with arson with intent to endanger life. The terminally-ill man, who was a patient at the hospice at the time of the fire, died days before the court case. No further charges are being brought by the police. Assistant Chief Fire Officer Mark Andrews said: “Fire safety in hospices, care homes or any similar property that provide rest, care or accommodation for vulnerable people is critical. The law is there to protect the residents and staff from the effects of fires and in this case the fire safety provision fell well below the standard expected in such a property where residents would otherwise expect to be safe. "We now hope this serves as a reminder to people responsible for the housing and care of vulnerable people of the importance of fire safety measures in their buildings." According to East Sussex Fire and Rescue Service (ESFRS), Judge Henson described the failures in fire safety as 'obvious and avoidable' during the Lewes Crown Court hearing. ESFRS say she went onto describe how the fire 'ruthlessly exposed the failures', such as locked doors, lack of evacuation training and equipment, and holes in the ceiling which allowed smoke to spread throughout the building. She added that a mock evacuation and basic training would have helped identify some of these deficiencies, and it shouldn’t have taken a fire to highlight these issues, ESFRS say. An ESFRS spokesman said: "The Judge emphasised that Hospice care must extend to keeping patients safe from fire risk and the charitable status of the Hospice cannot dilute the requirements for fire safety. The burden of compliance lies with the Hospice, which it should have been aware of since the Fire Safety Order has been around for over a decade and therefore it cannot pass responsibility to others."